The global geotextiles market is expected to reach US$6.4 bn in 2018 after displaying a CAGR of 10.30% between 2012 and 2018, according to Transparency Market Research. The market was valued at US$3.2 bn in 2011. The data is provided in a research report released on the Transparency website under the title “Geotextiles Market - Global Industry Analysis, Size, Share, Growth, Trends and Forecast, 2012 - 2018”. According to the report, the primary driver for the global geotextiles market is the rapid rate of growth of the industry of construction, within the fields of bridges, dams, roadways, and other infrastructural amenities. Construction is a core application segment of the global geotextiles market; therefore, any factors that influence construction will indirectly affect the global geotextiles market.The report also explains the impact of the booming construction sectors in the BRIC nations. As their rate of industrialization has increased, the global geotextiles market gets its demand index raised. The market’s growth is further bolstered by government regulations that fall in favor of geotextile usage and international investors that are looking to developing nations for modern markets. The report also delves into the restraining factors for the global geotextiles market. These include the volatility in raw material pricings. Polyester and polypropylene are the key raw materials used in manufacturing geotextiles. As the stockpiles of non-renewable resources decline, fluctuations in price can hinder the growth of the global geotextiles market. The report also describes the effect that a lack of standardization can have on the global geotextiles market, in terms of mechanical and physical properties.With products as the locus of the report, the global geotextiles market is segmented into knitted, woven, and non-woven. Among these, the global geotextiles market was dominated by non-woven textiles, which held a share of almost 60% in 2011. The report, however, states that the non-woven textiles segment is expected to lose market share to the segment of woven fabrics, which is currently increasing at a rapid rate. From the perspective of applications, the global geotextiles market is divided into drain management, soil erosion prevention and control, roadway construction, and others. 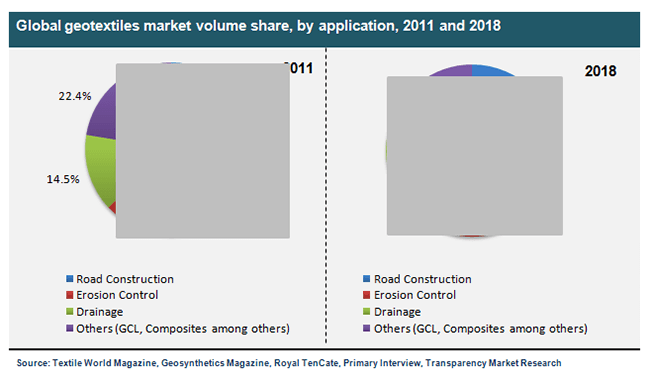 The segment of roadways construction was recorded to be around US$1.5 bn in 2011.The report also provides a geographical segmentation of the global geotextiles market, which reveals Asia Pacific to be the market leader for 2011 with a share of almost 41% in the market. According to the report, the geotextiles market in Europe could reach US$1.6 bn by 2018, while the North America geotextiles market is expected to progress at a CAGR of 9.90%.Key players in the global geotextiles market, as described in the report, are Propex, Low & Bonar, Officine Maccaferri, NAUE GmbH & Co. KG., GSE Holding, Inc., and Royal TenCafe.